I put this scenario together to clothe and house a math question that came up one night at a party. It’s part of my ongoing quest to show how math can answer interesting questions and be a fun form of play. This is appropriate for students who’ve learned some trigonometry, homeschoolers of any age, or people who just like exploring with math. Let’s play math together! The year is 1849. You’re a talented young goldsmith from New York who’s just finished your Aurifaber’s Residency at Thomas Higgins & Co just outside Boston. Like many young folks in those days, and like Huckleberry Finn 40 years later, you’ve decided to light out for the Territory and seek your fortune out in the world. After some arduous traveling, you made it to Culloma, California, the center of the gold rush. (Luckily you missed out on some of the hardest traveling the mountains had to offer.) You set up a goldsmithing shop in the center of town and quickly developed it into a thriving business as prospectors brought their gold, silver, and other precious finds straight from the assay office and into your waiting hands. Your reputation grew quickly, backed by hard work and an eye for detail. One day, the county’s Sheriff walked in. 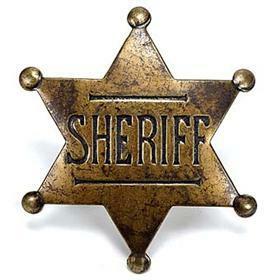 He sat down and thrust out his badge, a worn and venerable-looking six-pointed affair. 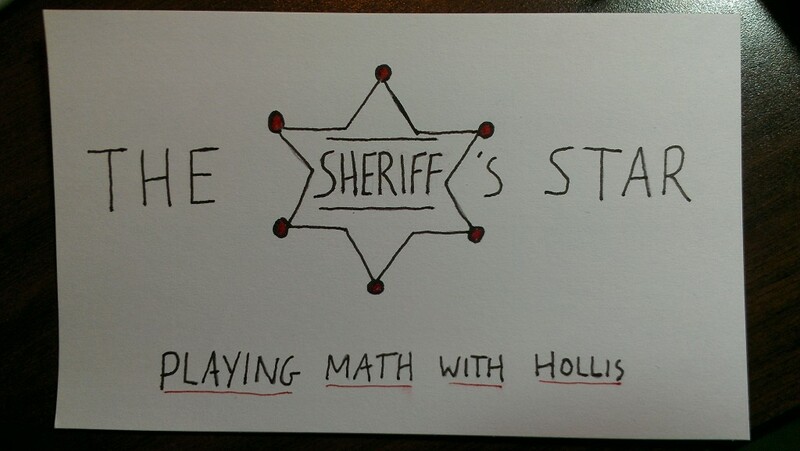 “Can you make me a new one?” said the Sheriff. You don’t have a protractor. The Sheriff wants his badges to reflect the highest standards of police work, and that means he wants all the angles to be equal, so the badges look great. You don’t have any tools for measuring angles. A short form of this problem is: how can you draw a regular n-sided polygon without measuring angles? There are at least two solutions: one uses cleverness, triangles, and trigonometry; another uses cleverness and basic arithmetic. Both are fun. How would you solve it? Is there a way you could use some tasty math to approach this problem? Can your solution create a regular n-sided polygon for any n >= 3? Once I finish typing up the solutions, I’ll replace this paragraph with the link to the solutions page. If you’d like to be notified when I post the solutions, please follow me on Feedly or Twitter or leave a comment on this page. Please don’t post your solutions on this page, because we want everyone to have fun playing math. Once the solutions page is up, you can post your solutions there! Enjoy yourselves!